St. Maarten Direct Oceanfront Unit: 3 bedrooms / 3 bathrooms with over 2,500 square feet of living space. This unit sleeps 8 people comfortably on new mattresses. This unit features brand new furnishings, luxurious décor and a breathtaking direct oceanfront view. This building offers over 400 feet of ocean footage, direct beach access, 2 oceanfront heated pools, 1 indoor heated pool and hot tubs. A state-of-the-art fitness facility with separate his/hers saunas and a game room with pool tables – great amenities. One of the newer buildings along the coast. This 2nd floor unit sits over one of the swimming pools, which is perfect for keeping a close eye on the kids. This low-floor unit allows you to hear the relaxing sounds of the ocean. The unit features tinted windows to help maintain privacy from the pool deck. The open floor plan is ideal for couples or large families with children to share. The 9ft ceilings make this condominum feel like a house! Huge balcony with patio set, perfect to sit and enjoy the magical view! Massive sliding doors in the living room and a garden door from the Master Bedroom allow access to the balcony. Enjoy your favorite shows on over 225 HD cable channels on our 4 HD televisions, including a 55” in the living room. Enjoy a separate laundry room with GE washer and dryer. Top of the line appliances with smooth-top-stove, built-in microwave, dishwasher, coffee maker, blender and solid granite countertops. The full-kitchen is stocked with cooking equipment, utensils, dishware, glasses and a huge pantry. For your convenience, a separate private storage closet located just outside the unit and is equipped with beach accessories to be used. Non-smoking and no pets for everyone’s enjoyment. The Master Suite has a king-size bed, features direct views of the ocean and direct access to the balcony, a huge walk-in closet and bathroom (ft. garden bathtub and tiled shower for two). Bedroom II has a queen-size bed, ample closet space and a private bathroom. Bedroom III has 2 queen-size beds with lots of closet space. All bedrooms have comfortable mattresses, flat-screen televisions, linens and pillows. Shower and beach towels are supplied. The unit includes free high-speed wireless Internet access, accessible from every room in the apartment. Free phone calling across the United States and Canada. Secured underground assigned parking and guest parking spot on the upper deck. Secured building with top-of-the-line surveillance equipment and an on-site building manager. Daytona Beach Shores is rated one of the Top 10 Beach Areas in Florida! With many attractions nearby to allow the whole family a fun filled vacation. Disney World and other Orlando area attractions are only an hour away. A wide selection of golf courses nearby – perfect for golfers of all handicaps. 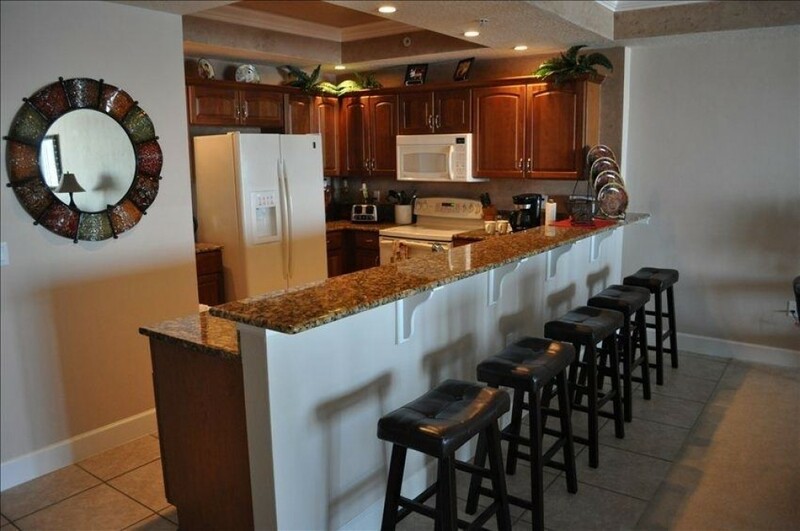 Under 10 miles from the Daytona International Speedway, Volusia Mall and the Daytona International Airport. Breathtaking ocean views, spacious/luxury unit, great amenities and a nearby ice-cream parlor - what more can you ask for? Just bring sunscreen and flip-flops! Come create some memories with us! Daytona Beach Shores "Life is better here"